Meow. I am Marvain von Purr. I am 12 years old and I come from a noble family. It shows on the outside of course. My fur is glossy and smooth, not to mention the sublime shape of my muzzle. My father, Lo-Growl Cheetah comes from the Other World. I still have family there. When he was young, Dad lived in a big manor and prowled the forest, as he was expected to. In the Other World all cats who know their own worth hunt. But because my Dad was a big adventurer, he needed more excitement in his life. So he went out to sea. 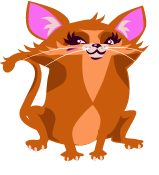 My mum, Lina Cheetah – her maiden name was Grace – was born on Gadget Island. My mother’s father was the leader and doctor of the island. The whole Grace family is an old healer family. They have always lived here. When my father arrived on Gadget Island, my mother was a kind of princess of the island, so my father chose her as his wife. I’ve researched our ancestry online using a family tree research programme. After a lot of searching, I found out that my Dad’s family’s name was once von Purr. But later it was changed to a more vernacular form. With my parents’ permission I changed my name back to von Purr. I don’t want to have Cheetah as my surname. Especially not when I become a famous actor or model. I practise for my future career my taking photos of myself every day. I use an old barn as my photography studio. I find my best expressions and most attractive looks in front of the mirror. I can already do 53 different poses. With a good-quality photo editing programme, I can make the photos look fantastic. The best photos I send to Marymoo the Cow’s gADget advertising agency. I hope that Marymoo the Cow chooses me to present her next advertising campaign. I don’t like the photographs they take at school. Meow. In those photos I almost always look stupid. Last year mum sent one of those horrible photos to my dad’s relatives. She didn’t even ask me first! I didn’t like that. Mum felt really bad when she realised that I have the right to decide what kind of photos of me are shared. Nowadays Mum always asks for approval from us children before sharing photos with other people. As well as photography, I also like films. I write, direct and film my own short films on my mobile phone, and I play the main roles in all of these myself. I upload the films to YouVideo. Everyone can watch my films there. First I’m going to become the biggest star on the island, and after that I’m going to conquer all of the Other World. Marvain von Purr is in a bad mood. He wanted photos of himself. He asked Gonzales the Cheetah and Higgy Hedgehog to take the photos. Taking the photos was fun, although some of the photos didn’t come out well. Now these embarrassing photos are online for everyone to see. How could this be possible? It becomes clear that Gonzales and Higgy have shared the photos on social media, because they thought it would be fun. The photos have also been edited and spread further. Not only this, but the comments on the photos aren’t very nice. Marvain feels ashamed. He decides to take horrible photos of Gonzales and Higgy, and asks his friends to come and be photographed. Pretend that you’re Marvain, Gonzales and Higgy. Marvain takes friendship pictures of Gonzales and Higgy. Take pictures of one another in three-person groups. Change roles. Everyone can choose one photo which can be shared with others. The chosen photos will be shown to the whole group. If you don’t have a camera available, you can take pretend photos in front of a mirror. How did the photos taken of you look? Why did you choose the photo you chose? What photo don’t you want to share? Why? How would you feel if embarrassing photos taken of you were available for everyone to see? Marvain took photos of Gonzales and Higgy. However, before sharing the photos he asked his friends how they would feel if the pictures were shared online. Then Gonzales and Higgy realised how something that they thought was a fun joke was actually bullying. Because the pictures cannot be taken off the internet, they wondered how they could fix the error. What should the animal friends do now? Discuss. In the evening Marvain told Mum what had happened. After talking to Mum, Gonzales apologised to Marvain and promised that he would not do it again. A phone is a useful and fun device, but sometimes a game that seems fun to you might not seem so nice to someone else. The aim of this is to take nice and embarrassing photos and to learn to express what kind of picture you would want to be shared with others. Another aim is to understand that a game that might feel fun to one person, may not feel so good to another.